The aronia plant (Aronia melanocarpa = black chokeberry) is a small shrub of about 1-2 meters in height, which thrives very well in our latitudes and is extremely resistant. The berries grow in umbels, similar to elderberry. 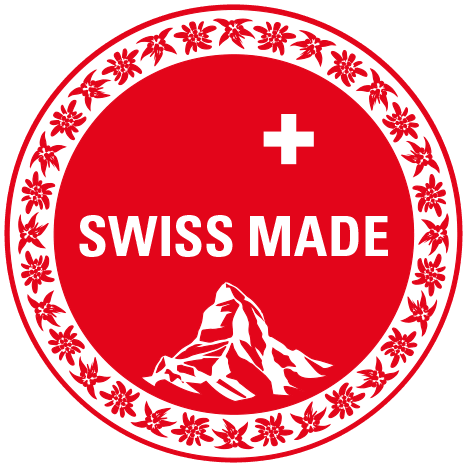 Our berries are 100% Swiss and processed in Switzerland. 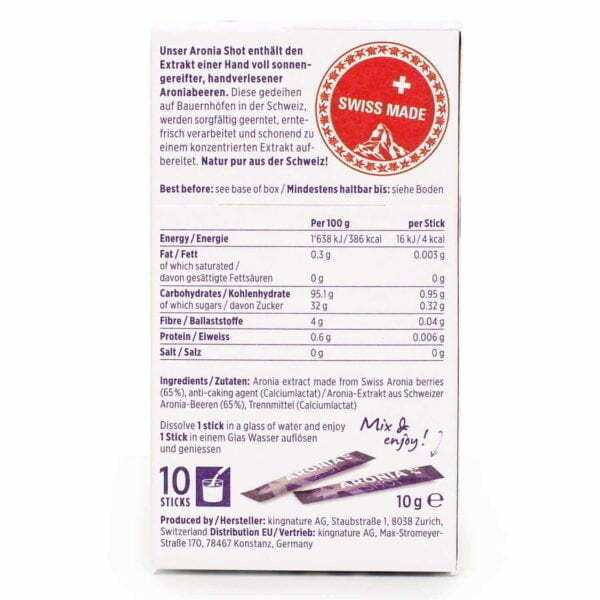 Thus, our Aronia extract is 100% Swiss. Aronia berries have a remarkable content of OPC (= Oligomeric Proanthocyanidins) and Polyphenols in comparison with other fruits. 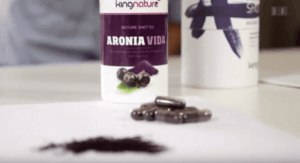 Aronia contains around 10,000 mg of polyphenols per kilo of fresh berries, while blackberries cut out at around 2,500 mg, raspberries at around 1300 mg and strawberries at over 1000 mg (each per kg of fresh fruit) *. 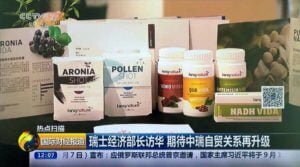 A similar picture can be seen with the anthocyanins: Aronia berries contain around 4300 mg, blackberries around 1100 mg, raspberries and strawberries each about 250 mg (each per kg fresh fruit). * Jakobek L et al. 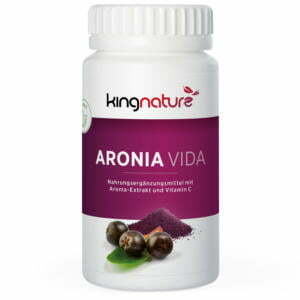 (2007): Antioxidant activity and polyphenols of Aronia in comparison to other berry species. Agr Consp Sci Vol. 72 (4), pp. 301-306. The difference is simple. 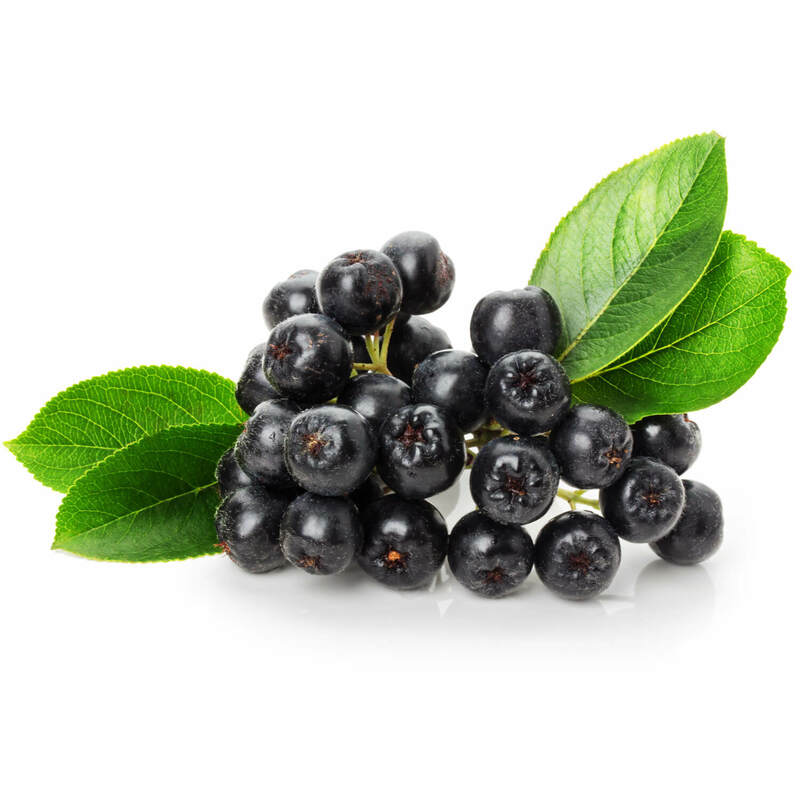 Aronia extract is a highly concentrated form of Aronia pomace. 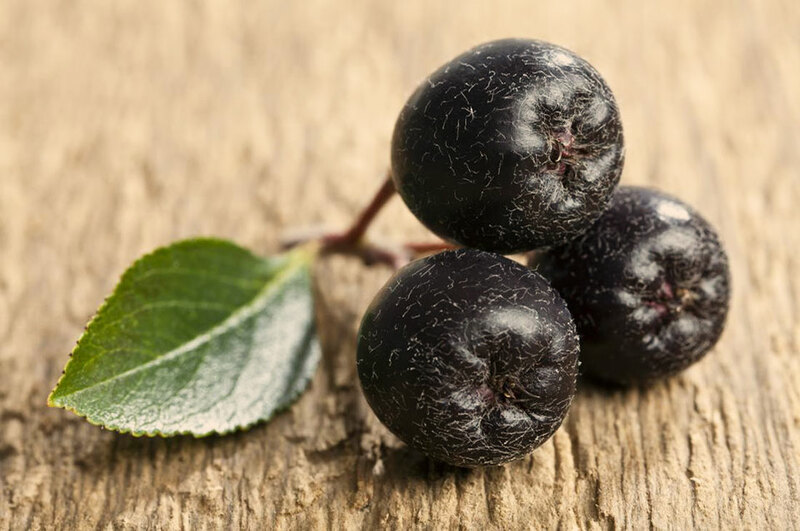 For the production of the extract, a multiple of berries is needed in comparison with the pomace. 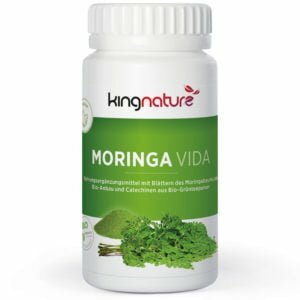 We work together with a Swiss biotech company on extract production and can guarantee gentle production with the highest possible concentration. 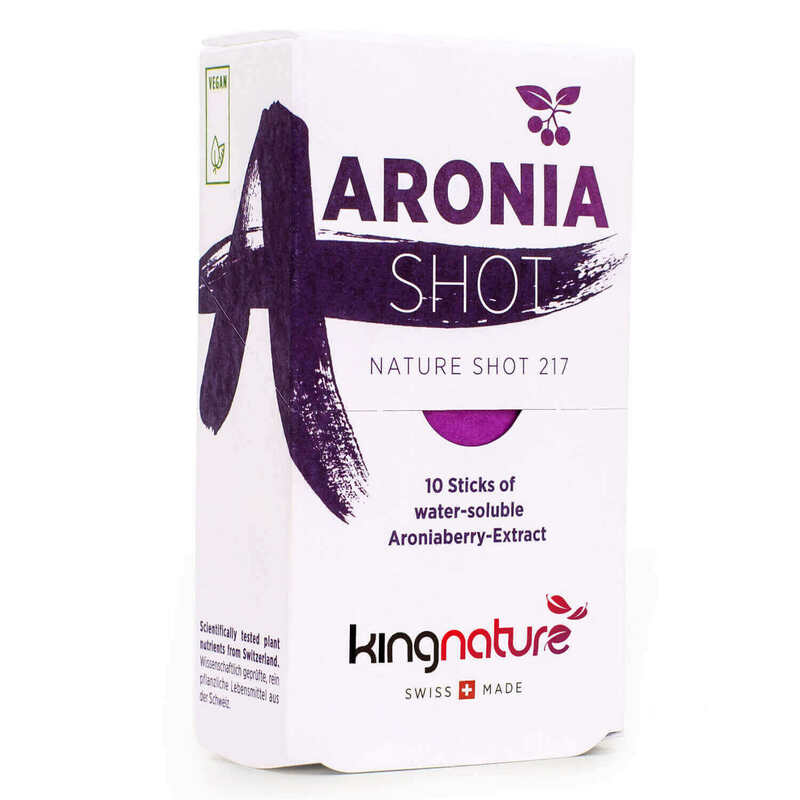 What are the benefits of Aronia Shots? Buy online Aronia Shot now: We also accept Visa / Mastercard and Postcard. CH-customers please use our CH-Shop. 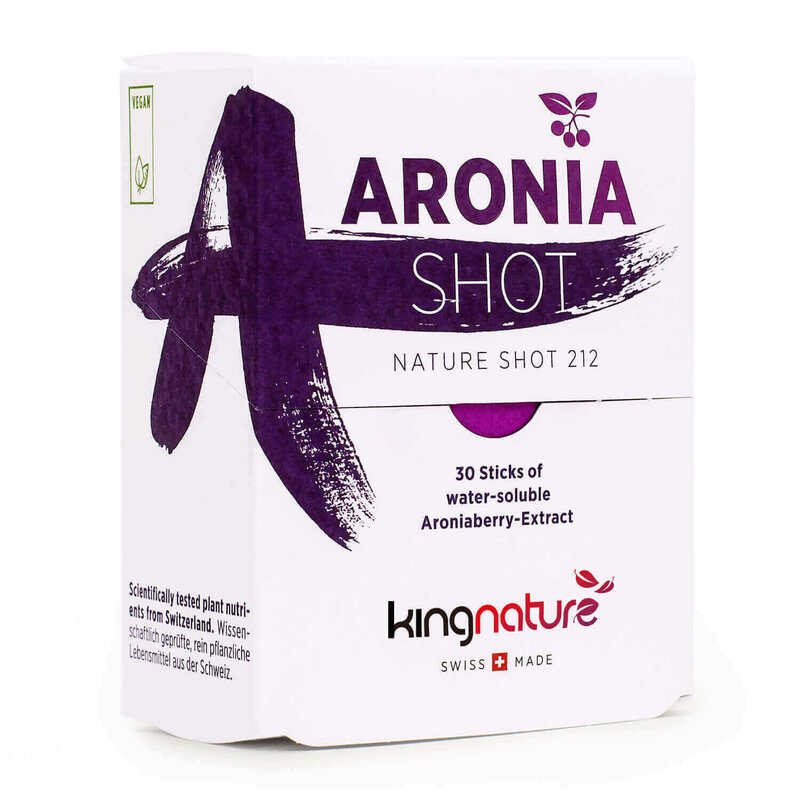 Aronia Shot contains 30 sticks with 1 g each of aronia berry extract and 80 mg vitamin C. Net content 30g. Available ex stock. 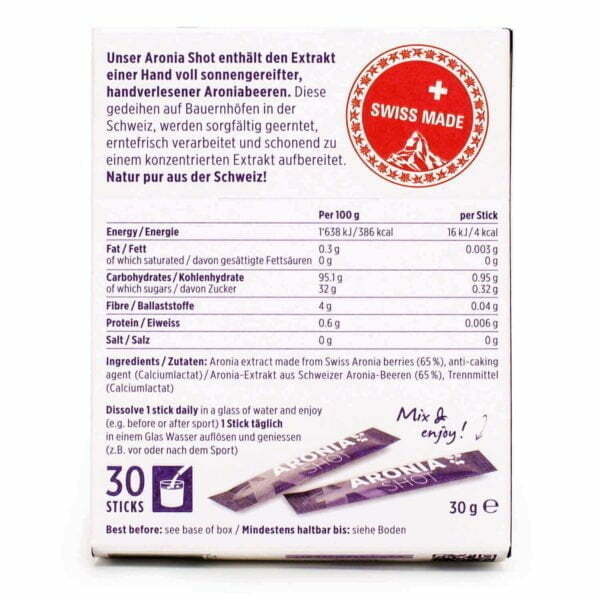 Aronia Shot is also available at your pharmacy or drugstore (Pharmacode 6083607). Dissolve 1 stick (before or after exercise) in a glass of water or a sports drink of your choice and consume.